Mixed vegetables is a great side dish to a good portion of protein like a fillet of chicken or fish. Sharing a desi and a standard version of the mixed vegetable recipe. I love the desi mixed vegetables recipe with white rice or roti. The standard one goes great for lunch and we usually make a bulk amount on Sunday to last us the entire week. A lot of you requested this recipe as I did some bulk cooking on a Sunday and shared on my Instagram stories, so here goes! Frozen peas, cauliflower, kale, carrots, potatoes, chickpeas, tomatoes, onion, coconut oil, salt, pepper, chilli powder. Heat two tablespoon of coconut oil in a pot. Add the onions and let them change colour. Now add the spices and stir a little. Cut potatoes, carrots and tomatoes in small pieces. Add potatoes, carrots, tomatoes and peas and let them cook. Cover the pot and reduce heat to low-medium for 10 minutes. Now add the rest of the vegetables and cook everything together in the pot for another five minutes and you’re done! Frozen peas, carrots, potatoes, tomatoes, chickpeas, onion, green chilies, fresh coriander, canola oil, salt, chilli powder, cumin whole, dried fenugreek. Cut potatoes, carrots and tomatoes in small pieces. Take out the peas. Keep all vegetables separately. Cut onion in small pieces and fry in a pot. After onion becomes golden put in salt, red chilies and cumin and fry together. Then put in all the vegetables. No need to add water. Mix all the masala and the vegetables and put on the lid. Cook on low to medium for 15-20 minutes. Check the chickpeas and the potatoes. If they are done, add the dry fenugreek. Mix everything together. Garnish with green chillies and fresh coriander. 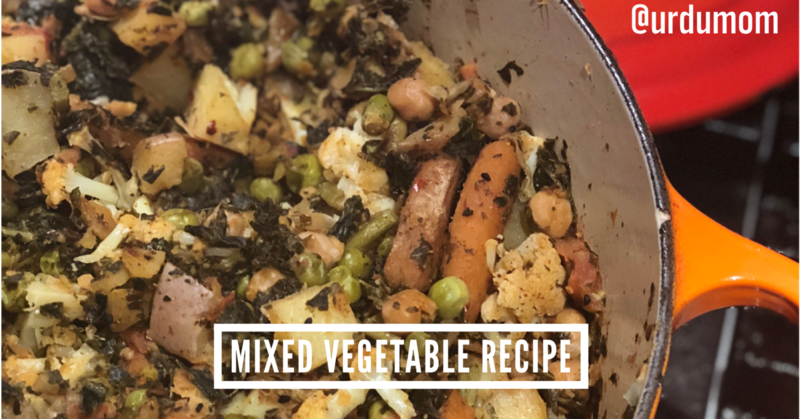 Hope you enjoy these two versions of the mixed vegetable recipe. Let me know if you try it!